2 Kanfer, Stefan, Ball of Fire: The Tumultuous Life and Comic Art of Lucille Ball, 10-11. 3 Roberts, Gary Boyd, Notable Kin, Volume 2 , Santa Clarita, California: Carl Boyer, 3rd (1999), 84, 187. 4 Sheridan, James and Barry Monush, Lucille Ball FAQ: Everything Left to Know About America's Favorite Redhead, Milwaukee, Wisconsin: Applause Theatre and Cinema Books (2011). 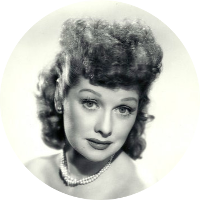 5 Wikipedia, "Lucille Ball", (accessed 04/07/2011).